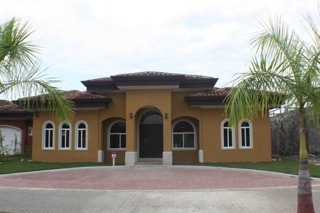 Address: ESTERILLOS ESTE Type: Residential Style: Development Level: Built Bedrooms: 3 Bathrooms: 3 Size: 2,000 sq. ft. Lot Type: Rectangular Lot Size: 500 sq. m.
This home is set in the gated community features a large pool area, barbeque/club house, volleyball court, tennis court, and only 200 meter access to the stunning Bejuco Beach. This home is brand new and ready to be rented, loved and lived in. wonderful gated community located on the Central Pacific coast of Costa Rica at Playa Bejuco in the province of Puntarenus only 1 1/2 hours from the San Jose International Airport. Convenient to Jaco which is only about 20 minutes north and Parrita approx 15 minutes south the secluded tropical beauty of the rich vegetation and palm trees along this pristine volcanic black sand beach make you realize you have found a little piece of paradise! When exploring the area you will find dramatic bluffs and rolling hills that offer ideal coastal views. Tropical forests, peaceful mangroves, coconut and palm oil groves make an ideal setting for a large variety of native plants and wildlife! The longer you stay the more it unfolds its mysteries and treasures!